The weather has been fairly mild recently, but a bit mixed. The summer typically sees around a dozen or so cruiseships visit the island, with a display of island crafts set up in the hall. This continues the old Fair Isle tradition of bartering goods with passing boats, although in a safer and more comfortable environment than when islanders would have rowed out to meet boats in their yoals. 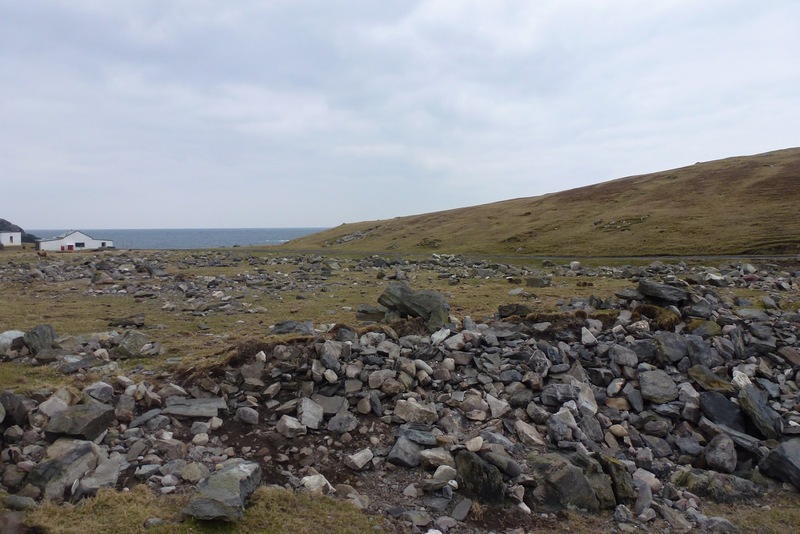 Also a more modern way of trading are the websites of several islanders who are now able to sell the famous Fair Isle knitwear around the world. These visitors from an Australian cruiseship company that called in to the island on Friday morning are perusing the goods of Elizabeth Riddiford of Schoolton. We had another enjoyable Fair Isle Thursday this week, with music by Neil, Stewart and young Stewart. 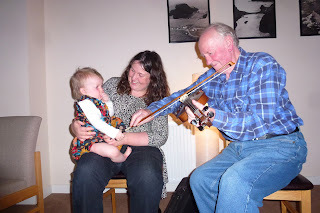 Even Freyja got to have a go at playing some tunes with Shirva Stewart! Surely this must be summer now? 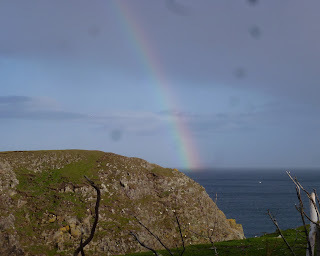 The weather might not always seem to agree (we’ve had a couple of greyer, wetter days in the last week), but the Log is finally starting to reflect the end of spring passage. That said, a male Red-backed Shrike was caught in the Vaadal on 2nd July, an unusually late record (the bird was regrowing half its tail, so perhaps it had survived a run-in with a predator somewhere in the Northern Isles and was heading off again having become more mobile). Also new was a Long-eared Owl in the South Raeva on 29th June - who knows where that was heading? 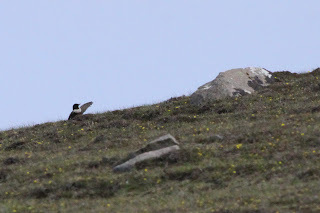 The 30th saw new Blackcap and Willow Warbler trapped on morning rounds (I’d love to find out which way they went after leaving Fair Isle), but the Ring Ouzel at the Kirn o’Skroo (found on 30th and still present on 4th) may have been a lingering bird, as it had a damaged leg, so could have been the similarly disadvantaged individual seen in early June (and perhaps also responsible for the sighting in the Kirn on 15th June). Hiya! 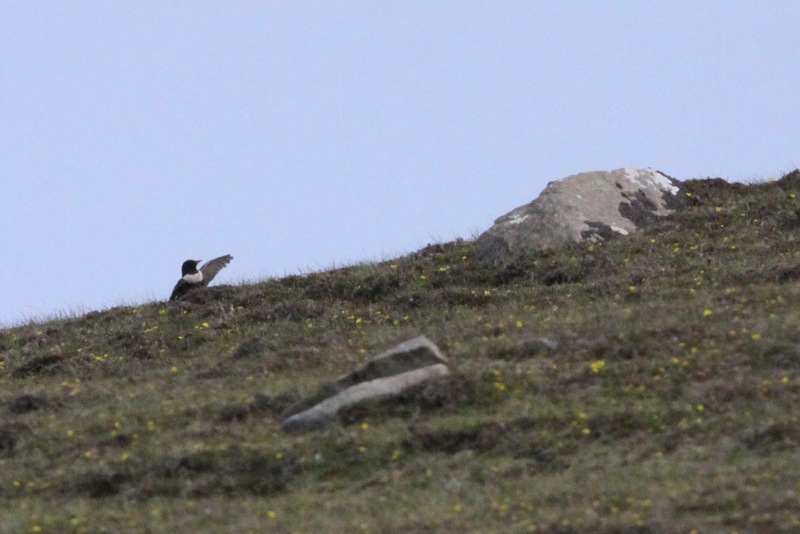 The Ring Ouzel waves hello. The Black Redstart on 27th at Barkland may also have been lurking somewhere since the last sighting (on 16th). Two Woodpigeon on 1st-2nd July were new, but didn’t really compete with the Bridled Tern, Pacific Golden Plover or Two-barred Crossbill found on other offshore UK outposts at the same time, such is the unpredictable marvel of early summer migration. A good ‘at sea’ record was a stunning adult Pomarine Skua which followed the Good Shepherd for about five miles or so as it approached the island on 4th, with two Manx Shearwaters seen on the same trip. The rest of the migrants were pretty much all lingering birds, with three Marsh Warblers still around early this month, a Reed Warbler still in the Obs garden, no sign of the Subalpine Warbler after the 27th (it either departed or succumbed in the very wet day on 28th), a couple of Chiffchaff at the Obs, Tree Sparrows still lingering (no sign of them nesting, although only one bird has been seen the last couple of days…), a couple each of House Martin, Swift and Swallow, Collared Dove, Robin and Blackbird (the latter two both still lurking surreptitiously at the Obs). Presumed wandering failed breeders included 3 Wigeon, Golden Plover, and increasing Redshank, Curlew and Turnstone numbers, although the Whimbrel sightings are trickier to work out, with birds having been recorded continually throughout the spring. The male Tufted Duck is also still lurking around the island’s water bodies. 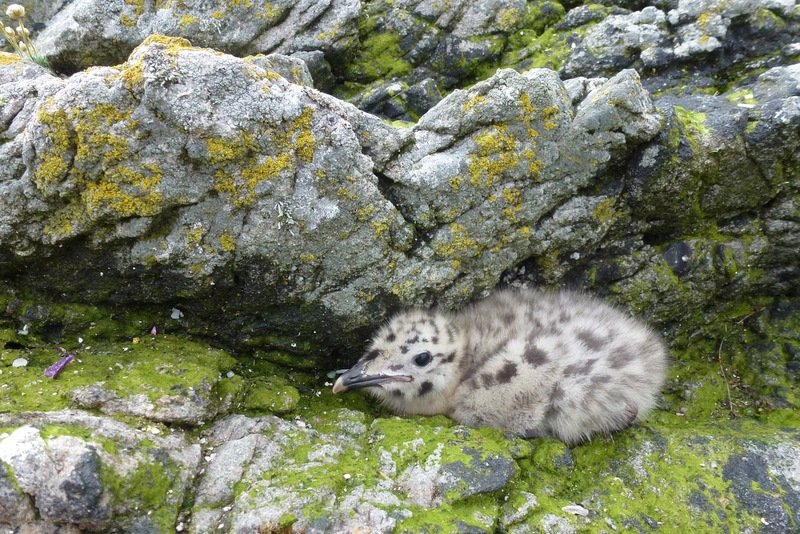 A juvenile Black-headed Gull on 1st was the first wandering youngster from populations elsewhere (possibly Shetland given that it was seen over North Light). 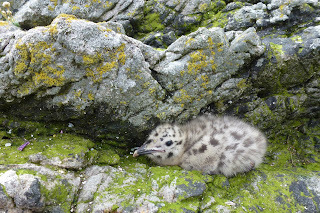 A Herring Gull chick on Goorn, where the mixed gull colony contains four species (although only one pair each of Great Black-backed and Common) and seems to be doing well so far this year. Breeding bird news has seen the first Arctic Skua and Kittiwake chicks hatch, but sadly the odds are against either of them surviving (although the Arctic Skua nest is the same one that has reared the only chick to fledging in the last two years, so perhaps there’s a glimmer of hope), whilst on land there are several fledged Wheatear and Twite now roaming the island top. 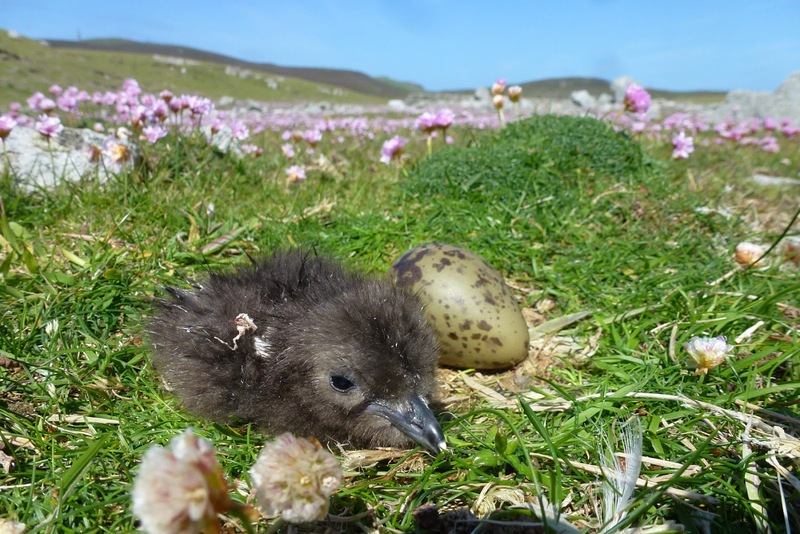 The recently hatched Arctic Skua chick. 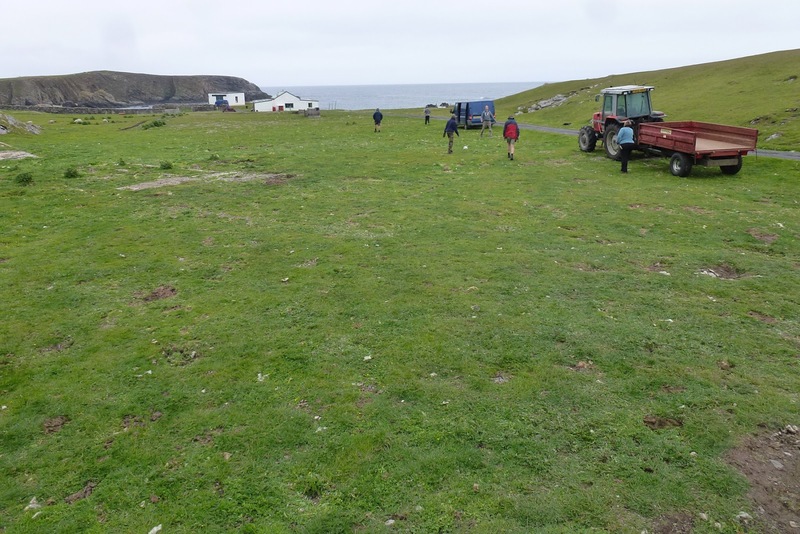 The summer also sees the National Trust work camp visit the island, which is an opportunity to get some of the jobs done that benefit from extra pairs of keen hands. 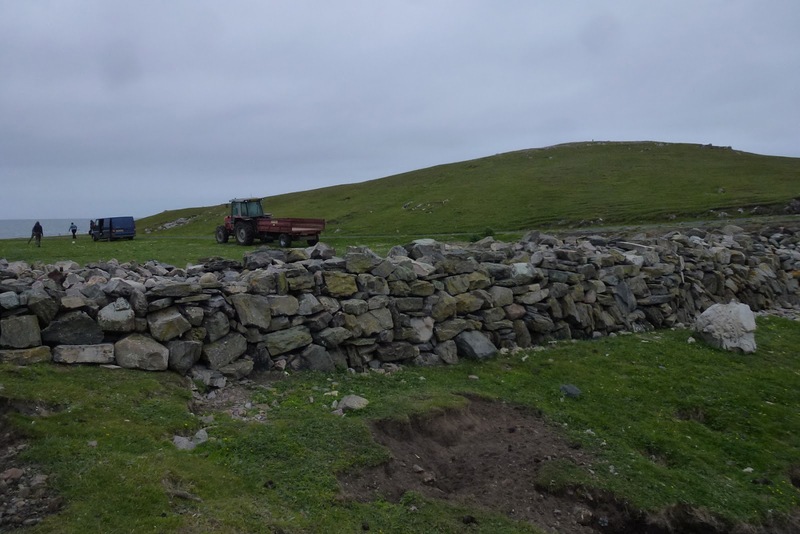 We've got a few jobs lined up at the Obs, but I'd best not list them here in case any of the volunteers are reading and decide they don't want to do them! 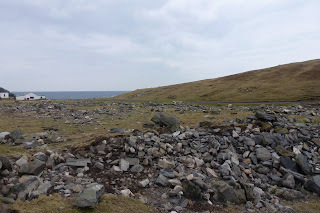 This picture from March shows the damage to the stone dyke breakwater at the Skadan after the monster waves that also demolished the South Light wall. The debris was strewn across a large area of grass heading towards the Puffinn. 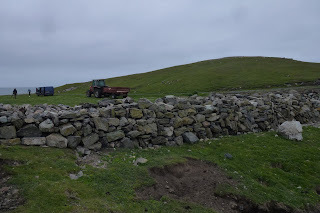 And here it is rebuilt wall after a full day's work by the workcamp and several of the Obs team and led by Iain and Daniel from Setter. The cleared area of grass is now looking a lot better (and suitable for football! ).